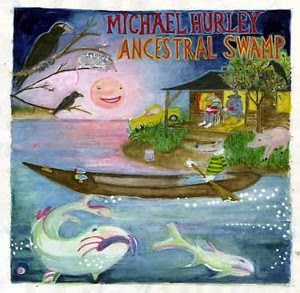 When listening to a Michael Hurley album, it’s easy to imagine that you’re sitting around a secret campfire in some hobo jungle near the railroad tracks. Hurley, who has been recording on the fringes for more than 40 years, is the hobo in chief, leading the singalong with sad and sometimes silly tunes about lost loves, old friends, funny uncles, drunken misadventures, and hard-won wisdom. But the quiet bum sitting beside you might just be a werewolf. You hear a mythical America in Hurley’s songs. When you submerge yourself in his music it’s like hopping a freight train that takes you through archetypal back-road America, through marshlands and past graveyards, then detours through Big Rock Candy Mountain and Dogpatch U.S.A. And before you know it, the train is chugging through a cartoon universe populated by comical mutants, cosmic grifters, and psychedelic drifters. Ancestral Swamp has versions of two related songs: “Dying Crapshooter’s Blues,” written by Blind Willie McTell, and the classic cowboy song “Streets of Laredo.” Both deal with the last wishes of unfortunate men who are found dying on the street. The white-linen-wrapped cowboy and McTell’s irreverent gambler, Little Jessie, fantasize about grandiose funerals. I actually prefer David Bromberg’s faux-Dixieland version of “Dying Crapshooter’s Blues,” and my favorite take on “Streets of Laredo” is Webb Wilder’s version recorded in the ’90s. But Hurley gives both of these hoary tunes his own peculiar stamp. And both are appropriate additions to the Hurley mythos. This second effort by the Taos band can almost be heard as a concept album, not about “the vanishing West” but about the way in which traces of that violent but romantic era lurk just beneath the surface of modern times. 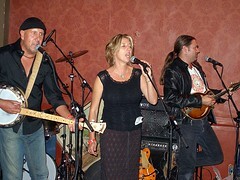 Bone Orchard is fronted by a married couple, Daniel Pretends Eagle (guitar, banjo, vocals) and Carol Morgan-Eagle (vocals). Daniel writes most of the songs. Taos music mainstay Chipper Thompson plays guitar and mandolin. The basic Bone Orchard sound is grounded in bluegrass, though the rhythm section (bass man Paul Reid and drummer Mark Bennett), as well as electric guitars, give the group a rock edge. I’m a confessed sucker for Billy the Kid songs, so I immediately was attracted to “Dancing With the Ghost of William Bonney.” But after a few listens I’m starting to prefer “Ole Virginny.” The melody is a lot like that of “The Cuckoo,” one of my favorite folk tunes. But what I really like hearing is the growling, feedbacking guitar playing off Thompson’s chiming mandolin. Also worth checking out is Orchard’s cover of Michael Franti’s hip-hop/bluegrass rewrite of “Wayfarin’ Stranger.” I hear a little bit of The Allman Brothers’ “Midnight Rider” in there. 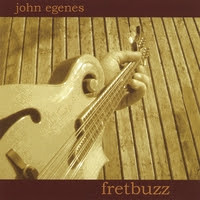 * Fretbuzz by John Egenes. For 30 years or so, John Egenes was a stalwart of local music. He played guitar, dobro, mandolin, steel guitar, and just about anything he could get his hands on for who knows how many Santa Fe acts, includingBill and Bonnie Hearne and Eliza Gilkyson. He moved to New Zealand a few years ago — he just earned a master’s degree in composition at the University of Otago in Dunedin — but he never stopped playing music. Fretbuzz is Egenes’ second album since moving to New Zealand. It’s the sind of good country music he was known for here. Though he used Dunedin musicians on the album, it’s good American music. My favorite tune here is “As Far as I Can Throw Her.” (I once used that title in a song, but John’s is better.) Also noteworthy is a little local flavor, a song called “Kiwi Moon.” I love the vocal harmonies on the refrain. Here Egenes informs us “A Kiwi girl loves to dance.” With music like this, it’s easy to see why.